Sumac has been around for centuries and derives from the berry of a plant called Rhus coriaria. Not too many people are familiar with this particular spice. It grows wildly in the Middle East and parts of Italy. The sumac used for spicing food is not to be confused with “poison sumac” also know as poison oak because, unless you’re psycho, nobody wants to poison her dinner guests. The taste is tart and lemony and was once used to calm the stomach. In my husband’s middle eastern home, his mother used sumac on everything from chicken, fish and grilled meats to vegetables, rice and salad. Although I will be using sumac in other recipes to come, I want to start my first blog post with this simple and delicious sumac chicken recipe, as it is one of my most highly requested recipes. I hope your family and friends enjoy it as much as mine do. Thank you to @Ginavon for getting me started and to @rimabarkett for your counsel in the kitchen. 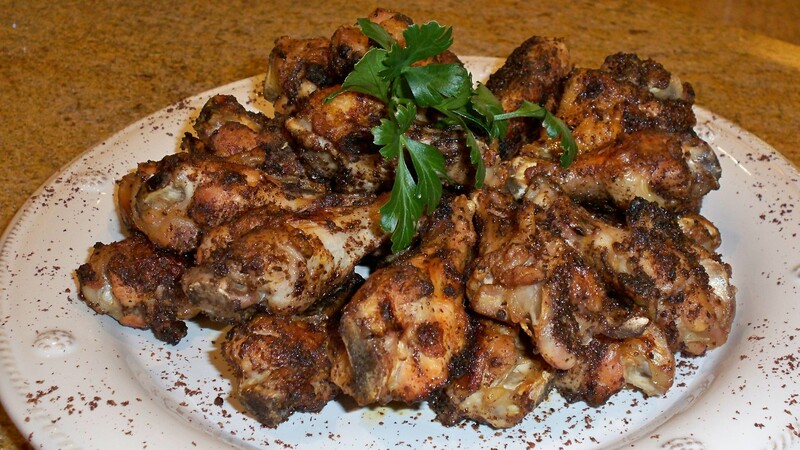 The best part about this recipe is that there are only three ingredients besides the chicken: seasoned salt, sumac and pepper. I am lucky to have had the opportunity to eat these on many an occasion. Sue’s Sumac Drumettes are a great dish and/or appetizer. Looking forward to your next recipe! I didn’t realize how easy this was to make. Another “Sue recipe” that my family goes crazy over! I put your website on my favorites list. I’m so happy that you posted a recipe using sumac. I have a little jar of it in my pantry, but wasn’t sure what I was going to do with it, and now I know. Your tweets are much more exciting than Jose Hernandez! I am so happy to have the recipe for those drumettes everyone goes crazy for. Congrats! I tried the summac drumettes. Simply DELICIOUS!! Thanks and I look forward to check in often for more. The site looks great…. I’m not much of a cook but you make some of these recipes look easy I think I will have to try…. Thanks for sharing….. I could lick the plate on this one, thanks a lot.